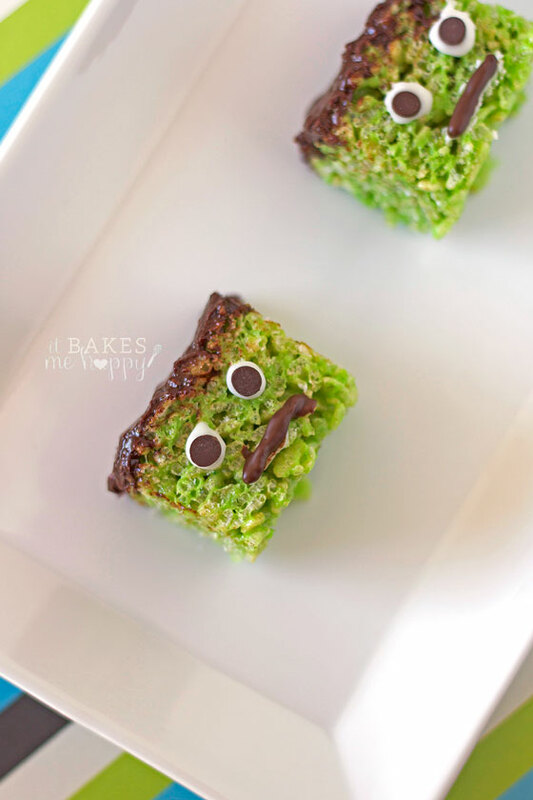 Celebrate Halloween with these adorable, tasty Frankenstein Rice Krispie Treats and the best part about them is that you can make them today using simple ingredients you already have on hand! Happy October y’all! I don’t know about you but I just love Halloween, its definitely my favorite holiday. One of the best parts about being a mom at Halloween is the fun of sharing it with my kids (and eating their candy once it’s bedtime). My kids like probably most kids love Rice Krispie Treats, oh who am I kidding… I love them too! They are super easy to make, using simple ingredients that the average person has on hand. I wanted to keep it simple because that’s pretty much the whole point behind no bake recipes right? So no running out to Target to find those little eyeball sprinkles or trying to find pre-made royal icing to glue them on with. No matter what you decide to call these fun little squares, they are sure to be a crowd favorite this Halloween; I hope you’ll enjoy them! Prepare an 8" x 8" pan with cooking spray, set aside. In a large microwave save bowl melt the butter for 1 minute. Add the marshmallows and stir to coat, return to the microwave for 1 minute. Remove the bowl carefully and add a few drops of yellow food coloring, 1 drop of blue food coloring and 1 teaspoon of vanilla, stir the mixture until smooth. Add the crispy rice cereal and stir to coat completely. Press the mixture into an 8" x 8" pan and cool completely. In a microwave safe bowl heat the heavy cream for 45 seconds, remove carefully and stir in the 1/3 c semisweet chocolate until smooth. Spread the chocolate ganache over the top of the rice krispie treats and place in the refrigerator for 20 minutes, until set. Remove the treats from the refrigerator and slice into 16 bars. In a small bowl stir together the powdered sugar and milk until smooth. Lay each bar on its side and using a tooth pick make two eyes with the white icing and place a miniature chocolate chip in the center of each eye, then using another tooth pick draw on a chocolate mouth, repeat until all bars are decorated. Let sit 10 minutes to dry, then serve.